PTA Members Save with Google Express! Shop all of your favorite stores—Costco, Whole Foods Market and more—without getting off the couch! an official Proud National PTA Sponsor. *Coupon expires 5/31/2017 and applies only to first purchase. Max discount per purchase is capped at $30. The coupon is limited to the first 1,000 coupon users per day. Gift cards, membership costs and shipping & service fees excluded. See terms and conditions at g.co/express/trial. Get Ready for Teacher Appreciation Week! National PTA’s Teacher Appreciation Week is May 8-12 and we can’t wait to celebrate the incredible teachers who deliver their best to children every day! To help you #ThankATeacher, we’ve put together a few fun resources like: Thank-you cards, Posters, Certificates of Appreciation and social media images. They are available in Spanish, too! Check them out at PTA.org/ThankATeacher. Earth Day is almost here, so gather up all those plastic bottle tops! Plastic caps come in all sorts of sizes and vibrant colors—which makes them PERFECT for craft projects. Plus, by re-using these caps, this fun craft becomes an instant recycling project, too. Read now. Many frustrated students lament, “Why do I need to learn math?” The truth is, arming your child with solid all-around mathematical knowledge gives them significant advantages as they navigate their way through school, college placement tests … and life. Read now. It’s no secret that science, technology, engineering and math are the fields of the future. Unfortunately, by 2018, over 2.4 million jobs could remain unfulfilled in the U.S. Women and minority groups are particularly underrepresented in STEM fields. But National PTA has a plan to fix all of that. Read now. Often parents and caretakers are unware that there are school-based police officers or “School Resource Officers (SROs)” among the school staff involved in their children’s education and discipline. Many parents may not know the scope of officers’ authority, and officers are not aware of what parents have been told about law enforcement’s role in the school. This causes anxiety, confusion, and at times produces significant problems that are hard to resolve and cast a shadow over school climate. In an effort to support parents’ understanding, Strategies for Youth has created this “Parent’s Checklist for SROs in Your Children’s Schools” to provide parents with a set of questions that will help parents understand the scope of authority that law enforcement may have in their child’s school. Does your school want to start an attendance push next year, or improve your current effort? Working with over 60 national partners, Attendance Works has launched plans for Attendance Awareness Month 2017 with a webinar and the release of the Count Us In!2017 toolkit, an essential guide to the templates, tools and strategies for making the most of activities this September. Let’s get all our children ready and set to go to school every day! Learn more at Awareness.AttendanceWorks.org. Calling All PTA Parents: Share Your Story! Do you have a great recipe, fun family craft, tip or “life-hack” you want share with other parents? We’d love to hear from you! Share your story with us by emailing OurChildrenMagazine@PTA.org or by using #PTAOurChildren on Twitter, Facebook or Instagram. Interested and want some tips? Check out our Submission Guidelines. 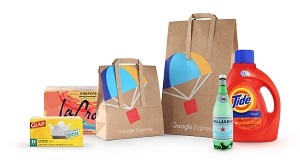 Shop all of your favorite stores and get it delivered fast with Google Express, an official Proud National PTA Sponsor. National PTA is pleased to announce the full list of nominees (slated and self-nominated) for election during the 2017 Convention & Expo. See the full list. Share National PTA’s #ThankATeacher contest with your local PTA units. They could win up to $4,500 in prizes for their school! Visit PTA.org/ThankATeacher. The National PTA Board of Directors recently passed new position statements. Details below. National PTA has issued a statement on President Trump’s budget priorities. Details below. Have you registered for the 2017 National PTA Convention & Expo yet? See the incredible act we booked for the Awards & Reflections Celebration below. 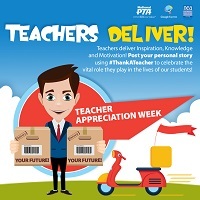 Complete the #ThankATeacher form on PTA.org/ThankATeacher. 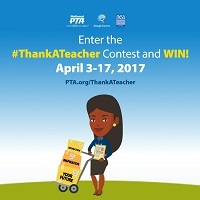 Visit PTA.org/ThankATeacher to see the full list of contest prizes, contest rules and answers to frequently asked questions. Want to promote the contest to your local PTA units? We’ve created a contest toolkit with flyers, social media graphics and sample tweets! Do you have questions about the #ThankATeacher Contest, or just want to learn more about the amazing prizes you might win? Join us on ourFacebook page for a special PTA Live! Mark your calendar for this National PTA Resolutions Committee webinar to review the resolutions that delegates will be voting on at the 2017 Convention & Expo. We can’t wait to see you in Las Vegas at Win with PTA … the 2017 National PTA Convention & Expo. Join thousands of PTA leaders, advocates, educators and other experts for learning, professional development and fun. Register now. The National PTA Board of Directors recently passed and/or updated four position statements. National PTA Position Statements are official documents outlining the opinion, will or intent of the association to address national problems, situations or concerns that affect children and youth and require national action to seek resolution on the issue. National PTA has adopted hundreds of position statements on a wide variety of national education, health and safety issues since its first convention in 1897. You can view some of them online. President Trump’s “skinny budget” or “blueprint” for funding priorities in Fiscal Year (FY) 2018 was released in March. 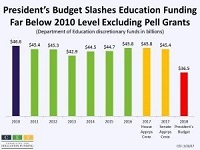 President Trump’s proposal would cut funding for public education programs by $9.2 billion. National PTA hopes President Trump’s full budget request (to be released in May) will propose funding for Statewide Family Engagement Centers, and ensure robust investments in Title I, Individuals with Disabilities Education Act state grants, Parent Training and Information Centers and other critical education grant programs. Learn more on the National PTA OneVoice Blog and by checking out the National PTA public policy agenda. Submit a comment to the U.S. Department of Education (ED) today atPTA.org/TakesAction to tell them stakeholder engagement is critical, not optional! The ED released a new guide for states to use in developing their education plans under the Every Student Succeeds Act (ESSA). While ESSA requires meaningful stakeholder engagement, the new guide does not compel states to include a description of how they are engaging and consulting stakeholders—like parents—in developing their plans. National PTA is extremely disappointed that stakeholder engagement is no longer prioritized in the new guide. National PTA also created a stakeholder media toolkit at PTA.org/ESSA for you to use and share to assist PTA members in demanding state leaders to include a description of how they will meaningfully consult different stakeholders in the implementation of the new state education plans. Friday, June 23 at 11:30 a.m.
Saturday, June 24 at 7:30 a.m.
Saturday, June 24 at 7 p.m.
We are thrilled to announce that Le PeTiT CiRqUe will be performing at the Celebration. Winner of 16 National Youth Awards, Le PeTiT CiRqUe has entertained audiences across the U.S. and internationally in Dubai and Canada. You’ve seen them all over national television—they appeared on NBC’s “LITTLE BIG SHOTS” as featured guest stars on March 26, 2017. Get your tickets for these amazing events today! Log in to your 2017 National PTA Convention & Expo registration and add tickets to the event to your account. It’s that simple! Not registered yet? Why wait? Register now and purchase your tickets at the same time! The U.S. Department of Education (ED) released a new guide for states to use in developing their education plans under the Every Student Succeeds Act (ESSA). While ESSA requires meaningful stakeholder engagement, the new guide does not compel states to include a description of how they are engaging and consulting stakeholders—like parents—in developing their plans. National PTA is extremely disappointed that stakeholder engagement is no longer prioritized in the new guide. 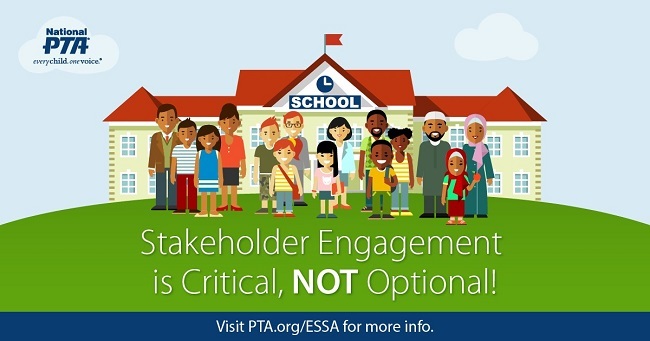 Submit a comment to ED today at PTA.org/TakesAction to tell them stakeholder engagement is critical, not optional! PTA leaders and advocates from across the country came together last month in Arlington, Va., for the 2017 National PTA Legislative Conference, “Celebrating 120 Years of Changing Children’s Lives”. During the conference, attendees enjoyed workshops on key education issues facing the new Congress, with discussions and trainings on how PTA advocates can shape public policy at home and on Capitol Hill in 2017 and in the years to come. Weren’t able to attend LegCon? Don’t worry! All PTA members can view the conference materials and workshop PowerPoints at PTA.org/LegCon. Maine PTA president Tracy Walker and president-elect Haley Tripp attended the National PTA Legislative Conference for the first time in March. These two outstanding advocates met with members of Congress in the nation’s capitol to advocate on behalf of Maine families and students. 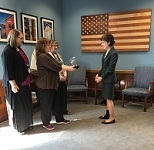 In addition, Walker and Tripp presented Senator Susan Collins (R-ME) with National PTA’s Congressional Voice for Children Award, in honor of Sen. Collins’ work to improve the lives of students and families across the country. What Should Parents Know About School-Based Law Enforcement Officers? Read the full checklist here. 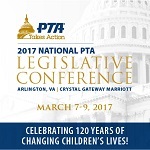 National PTA’s 2017 Legislative Conference was a great success! You can enjoy some of our favorite moments by watching the PTA live videos on our Facebook page. ALERT: A political action committee has been calling itself the “Parent Teacher Alliance” and using the PTA trademark while campaigning for candidates for the Los Angeles Unified School District School Board. More details below. The Jan Harp Domene Diversity and Inclusion Award deadline has been extended! Apply by March 31. March is National Reading Month! Show us how you’re celebrating by using #FamiliesRead on Facebook, Instagram and Twitter. Have you registered for the 2017 National PTA Convention & Expo yet? Special Family Reading Experience PTA Live! Join us on our Facebook page for a very special PTA Live! We’ll be visiting Parklawn Elementary School in Alexandria, Va., to celebrate National Reading Month. Register Now to join us during this webinar on federal protections available for immigrant children, and the actions you can take as an advocate to ensure that schools are safe and welcoming places for all students to learn. This spring, your students will take state tests in math and English language arts. These tests serve as one measure of how prepared each student is for the next grade. Test anxiety is real but there are simple ways we can help children tackle test nerves. Use the free resources from Learning Heroes to help make sure your child feels confident and prepared at BeALearningHero.org. How do you help your students tackle test nerves? Share your tips using #BeALearningHero on social media. A political action committee has been calling itself the “Parent Teacher Alliance” and using the PTA trademark while campaigning for candidates for the Los Angeles Unified School District School Board. Please be aware that National PTA, California State PTA and other constituent associations have no affiliation, connection or association with the Parent Teacher Alliance. The services offered and campaigns made by the Parent Teacher Alliance are not sponsored nor approved by National PTA. As you know, PTA is a nonpartisan association. As such, National PTA and its constituent associations never comment on, endorse nor support candidates for office. Any messages you hear or receive that state otherwise are not ours. National PTA takes this matter very seriously and is committed to ensuring it is resolved. New in 2017—Revisions to the National PTA Bylaws and Election Policy require self-nominations (formerly known as Intent to Run from the Floor) to be made electronically. No emails or written notifications will be accepted. Visit PTA.org/Elections to learn more. PTA members must submit their Self-Nominations using the online self-nominations form by April 1 to be able to run for office at the 2017 National PTA Convention & Expo, June 22 -25, in Las Vegas. Self-nominees must fill out the online form and provide their name, mailing address, email address, phone number and position sought. To access the form, visit PTA.org/Elections. For more information about elections and campaigning, contact the Convention Elections Committee. Great teachers ought to be recognized. If you know a seventh through 12th-grade educator that deserves the nation’s highest honor in STEM teaching, nominate them for the Presidential Awards for Excellence in Mathematics and Science Teaching (PAEMST). Anyone–parents, students, teachers or friends–can submit a nomination. Winners receive a signed certificate from the President, a trip to Washington, DC for recognition events and a $10,000 award from the National Science Foundation. Nominations close April 1, so nominate an exceptional teacher today. The College Board is hosting a social media contest for students called #Collegiance. Current high school seniors can enter the contest by pledging their #Collegiance to their future college or university with a creative video, Boomerang, or photo on Instagram with the hashtag. Film and media professors from College Board member institutions will select 10 winners, including a $5,000 grand prize winner. This is a great opportunity to celebrate students’ hard work, while also giving them a chance to earn additional money for college. You can learn more about the campaign, including the complete rules and a toolkit for educators, at Collegiance.org. Shop all your favorite stores and get it delivered fast with Google Express, an official Proud National PTA Sponsor. The Kindle for Kids Bundle is perfect for young readers. With access to thousands of books on one lightweight device, kids can keep reading without weighing down their backpacks. Learn more about the Kindle for Kids Bundle at Amazon.com. With the Schwan’s Cares fundraising program, your supporters enjoy our wide assortment of delicious foods from Schwan’s Home Service, Inc. while you earn up to 40% back for your PTA. It’s so easy. Delivery to your Door—Schwan’s Home Delivery will deliver each order to supporter’s doorstep. Keep on Earning—Earn up to 40% during your 45 day campaign and 5% for the next 90. Fundraising Made Easy—Supporters order online or by phone and we deliver directly to them. There is no door knocking and you never have to touch product or money. Disclosure: This email contains sponsored content from a third party. National PTA does not endorse any commercial entity, product or service.